Kitchen counter tops made from quartz are actually man-made stone products. Quartz it is composed by mainly by crushed crystal quartz and granite powder, polyester resins. Other materials, such as colored glass, coloring agents and UV absorbents are also mixed in.There are many manufacturers of Quartz counter tops, some of the most popular are Caesarstone, Silestone, Zodiaq, Viatera, MSI Q Premium. Quartz is a manufactured product and can be very attractive. 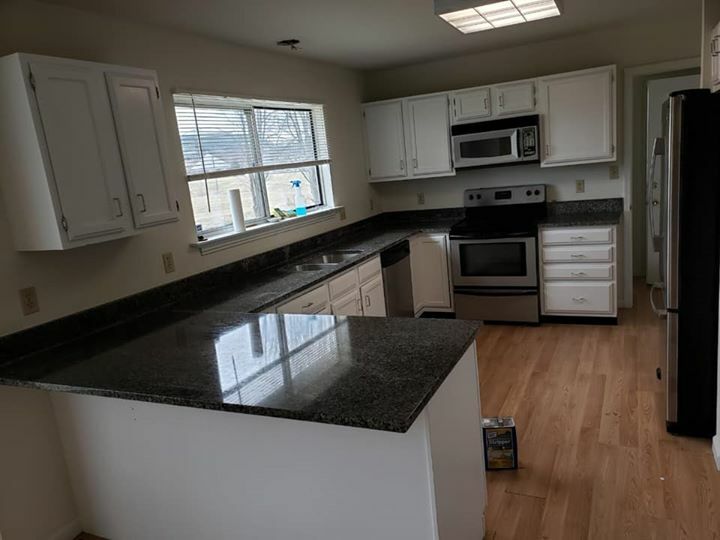 The manufacturing process allows just as wide range of colors as you will find in natural stones such as granite and marble, the main difference is that Quartz colors are more consistent throughout the entire slab. Quartz has the same durability as granite, and it will not chip or crack easily. Like other surface counter top materials, quartz is non-porous so it resists staining just like granite. Quartz does not require sealing or other routine maintenance to maintain its beauty and functionality. For cleanliness, you can use the same products used to clean natural stones, or simply soap and water. Conveniently located off Highway 364. Not sure what is the best choice for your project? 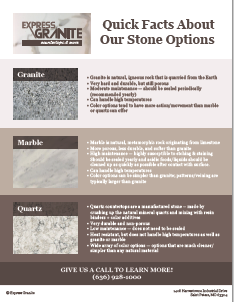 Of course, we will help you decide, but we’ll also give you some Quick Facts About Our Stone Options. Just send us some information about your project and you’ll be able to download the guide right away.